Thank you Ty, Michelle, Andy, Carissa, TomRod, Katherine, Jessica, Edgar, and Art for building an energized and experimental community of learning. 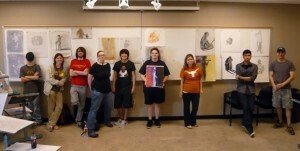 These students are standing in front of our final exhibition of drawings from the model. See our Label the Model video. See our Model, Sword, and Shark video.